To celebrate Jerome Robbins centennial, Pacific Northwest Ballet (PNB) opens its 46th season with two programs (A and B) that encompass seven Robbins ballets. Alternating these two programs throughout its run of two weeks at McCaw Hall, PNB has once again enchanted Seattle audiences with its dancers’ versatility in dancing and acting. On opening night of Pacific Northwest Ballet’s Jerome Robbins Festival, it was announced that PNB soloist Leta Biasucci was being promoted to principal dancer. Photo © Angela Sterling. On Friday’s opening night (9/21), excited ballet goers were presented with program A, a night of five ballets in total, and on the following night, PNB presented its program B, an assortment of three ballets with Circus Polka reappearing. As a dancer who had worked closely with Robbins during his time at the New York City Ballet, Peter Boal, PNB’s artistic director, opened this season with Circus Polka, a five-minutes ballet that involves a Ringmaster, in this case Boal, and 48 PNB students ranging from little girls in pink tutus to older students who already have the grace and poise of ballerinas. Saturday night’s performance welcomes Ariana Lallone back. Once a PNB principal ballerina, Lallone takes charge of the stage with ease and poise. 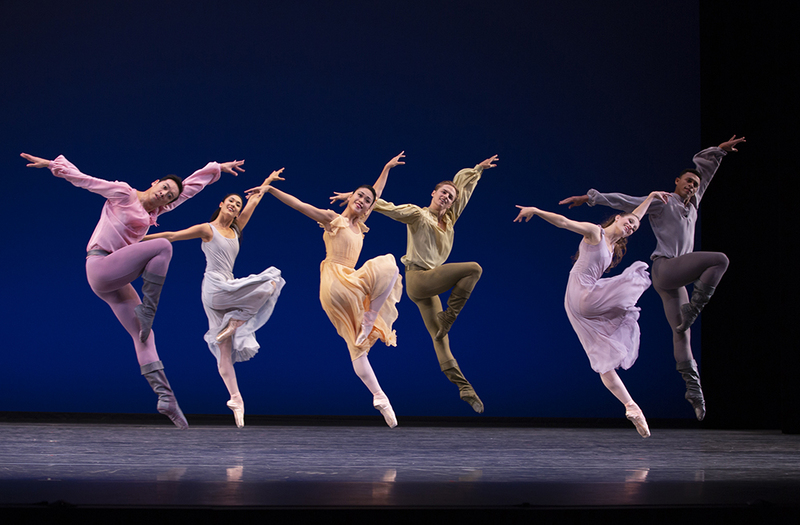 The remaining six ballets of program A and B are Robbins’ ‘In the Night’, ‘Afternoon of a Faun’, ‘Other Dances’, ‘West Side Story Suite’, ‘Dances at a Gathering’ and ‘The Concert’. Vastly individual and yet all very intimate, Robbins’ ballets listed here tend to all have the power to occupy and ignite the whole stage; no longer just focused on two dancers in the middle, Robbins’ ballets eat up the stage with its dancers constantly jumping, leaping on and off stage, and interacting and building their relationships with fellow dancers, pianists and orchestra. For us audiences, we know we are witnessing something beautiful and magical onstage, but we also suspect we are witnessing some very intimate and private moments. Pacific Northwest Ballet company dancers in Jerome Robbins’ In the Night. Photo © Angela Sterling. With ‘In the Night’ immediately coming after Circus Polka, we are invited into a night of romances and courtship that define the remaining night of performances. As newly-promoted principal dancer Leta Biasucci and her long-term partner onstage Benjamin Griffiths slowly walk onto the stage with the backdrop of glittering stars, we are slowly driven into their youthful love that has Biasucci twirling her arms as she turns and turns in the breeze of a young love. Principal dancers Laura Tisserand and William Lin-Yee, the second couple, demonstrate a much more mature and courtly love that has us feeling gentle and contented, but the highlight comes when principal dancers Noelani Pantastico and Jerome Tisserand come onto the stage with Pantastico’s legs kicking. Expressive in their acting, they showcase a couple who are passionate about each other, but can at times challenge each other. Following this soft romantic night of three couples, ‘Afternoon of a Faun’ gives us just another afternoon at a studio, and ‘Other Dances’ has one couple again takes us into their joyful courtship. Set as a small ballet studio, the stage is now a chance for us all to have a sneak peek into the place where all the magic begins. The curtain goes up with principal dancer James Moore lying on the floor, as if taking a nap. This ballet has the dancers testing out different movements, and both Moore and Foster masterfully create and present a moment onstage where their movements take on the feel of practice and make us know it is a rare treat to get to see the behind-the-scene moments. Pacific Northwest Ballet principal dancers Seth Orza and Noelani Pantastico in Jerome Robbins’ Other Dances. Photo © Angela Sterling. 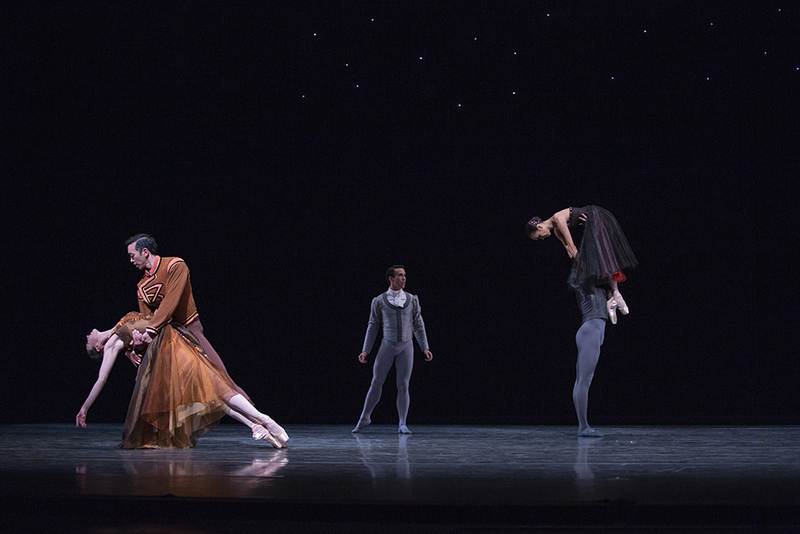 Robbins’ ‘Other Dances’, similar in movements and tone to ‘In the Night’, has only two dancers on stage, Pantastico and Orza, but it is a ballet that does not need anything else. Joyful in movements, it presents a couple who seems to be trying to out-dance each other; Pantastico takes on this role on opening night with ease, as she teases Orza and the audiences with a glance or a turning of a shoulder. 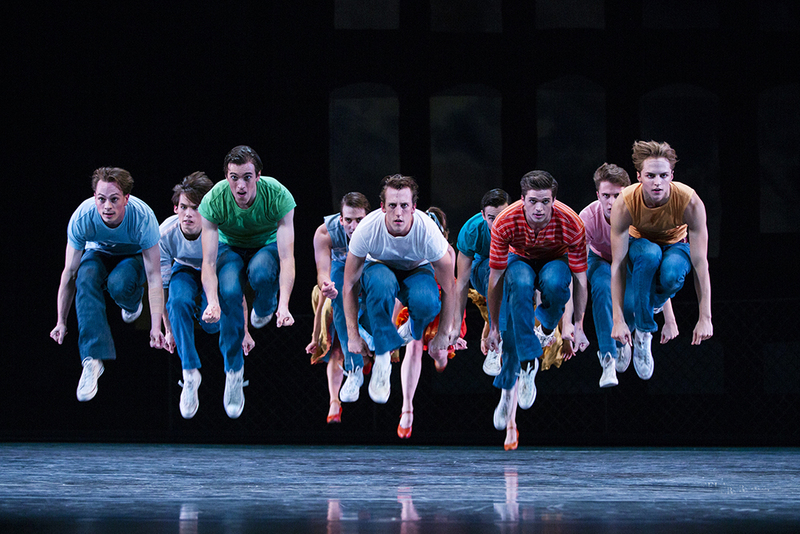 Pacific Northwest Ballet soloist Ezra Thomson (center) with company dancers in Jerome Robbins’ West Side Story Suite. Photo © Angela Sterling. Program A closes with an audience-favorite ‘West Side Story Suite’. Though it comes up quite often in PNB’s programs in recent years, its theatrical choreography that involves not only dancing but singing excites the audiences every single time. On opening night, principal dancers Lucien Postlewaite acts as the perfect Tony and Lindsi Dec again portrays a sassy Anita, but what makes it a moving experience for dancers and audiences alike is its deeply relevant message of peace, acceptance and diversity. On Saturday night, PNB brings back one of Robbins classics, ‘Dances at a Gathering’, and his comedic ballet, ‘The Concert’. Running for 58 minutes, ‘Dances at a Gathering’ is truly a hallmark of Robbins; with five female and five male dancers on stage, we experience with them many phases of life. 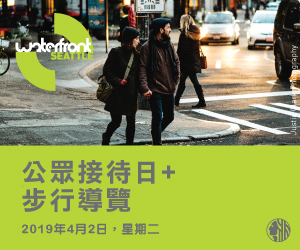 From youth, to a more mature age, we find friendship, competition, loneliness, breaking-up of relationships to finally self-reflection in this one hour ballet. Pacific Northwest Ballet company dancers in Jerome Robbins’ Dances at a Gathering. Photo © Angela Sterling. As dancers of different color dresses and shirts meet and engage with each other on stage, we too are being brought to different times of our lives, and as all ten dancers congregate together on stage near the end of the ballet, we temporarily forget that these are dancers performing a ballet that they have been preparing for several weeks; instead, we find them walking toward and away from each other a deeply moving and human moment, because Robbins captured what we all experience in life, the heartbreaks and the reunions, the leaving and the ones who stayed and the message underlying it all: everyone who participates in our lives, no matter a guest or a loved one, would all invariably change or alter our lives. Pacific Northwest Ballet principal dancer Lesley Rausch as The Ballerina in Jerome Robbins’ The Concert (or, The Perils of Everybody). Photo © Angela Sterling. Ending program B with ‘The Concert’ could very well be the best or the worst thing, since people would all be entertained, but they could also be too excited to sleep. Considered as the height of comedic ballet, ‘The Concert’ begins with a seemingly normal piano recital, but things quickly start to stray from the tune as each character or guest at the recital begin to show their individual personalities. Extremely funny and witty, this ballet again showcases how PNB dancers are versatile in every ballet thrown at them. Principal dancer Lesley Rausch, alway so clean in her techniques, becomes the ballerina who has the perfect timing in movements in order to make this ballet a comedic one.